St. Mary's, a Benedictine monastery, was once distinguished as the richest abbey in the north of England. It now stands in the attractive Yorkshire Museum Gardens, which occupy a sloping site on the north bank of the River Ouse and to the west of York Minster. 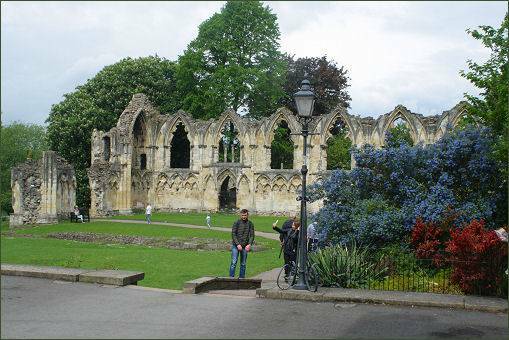 The remains of the Abbey were described by Edwin Ridsdale Tate in a 1929 publication in which he stated "Nowhere in England is there another spot so full of charm as York and where in York is there a more charming spot than the Gardens of the Philosophical Society, in which stand the beautiful fragments of that once powerful and noble monastery of St. Mary's. The original church on the site was founded in 1055 and dedicated to Saint Olaf II of Norway, Olaf II Haraldsson, who gave aid to Ethelred II the Redeless against the Danes in 1013. Following the Norman Conquest the church came into the possession of Alan Rufus, Count of Brittany who granted the lands to Abbot Stephen and a group of monks from Whitby. The monks moved to York from a site at Lastingham in Ryedale in the 1080s and are recorded there in the Domesday Book of 1086. The abbey church was refounded in 1088 when the then King, William II, known as 'Rufus', during a visit to York in January or February of that year and gave additional lands to the monks. The following year he laid the foundation stone of the new Norman church and the site was rededicated to the Virgin Mary. The abbey's economic power and privileges brought benefits to the city but were also a source of conflict. Following a dispute and riot in 1132 led by a prior named Richard, a group of 13 reform-minded monks left St. Mary's to establish the Cistercian monastery of Fountains Abbey. 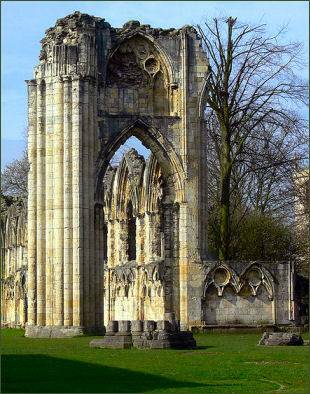 In 1137 the abbey was badly damaged by fire. The surviving ruins date from a rebuilding programme begun in 1271 and completed by 1294. 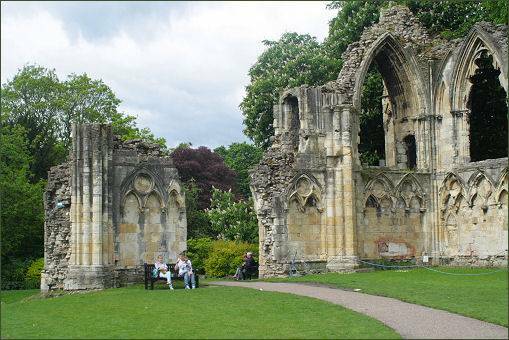 The abbey occupied an extensive site immediately outside the city walls of York, lying between Bootham and the River Ouse. The gatehouse in Marygate and its lodge formed part of a range of buildings that linked to the older church of St Olave by a chapel dedicated to Mary. Though work on the chapel and gatehouse was under way in 1314 and completed in 1320, the surviving structures are mostly of fifteenth century origin. The abbey church is aligned northeast-southwest, a rebuild commenced in 1270, under the direction of Abbot Simon de Warwick, and was completed during a twenty-four year building campaign. The completed abbey church measured 350 feet (110 metres) in length and consisted of a nave with aisles, north and south trancepts with chapels in an eastern aisle, and a presbytery with aisles. To the east of the cloister and on the line of the transepts were a vestibule leading to the chapter house, the scriptorium and library. Beyond the church lay the kitchen, novices' building and infirmary.The Abbey chronicle mentions the project officers as Simon de Warwick, a monk administrator and the master stonemason Master Simon. All that remains today are the north and west walls, plus a few other remnants- the half-timbered Pilgrims' Hospitium, the West Gate and the fourteenth century timber-framed Abbot's House. The walls include interval towers along the north and west stretches, St Mary's Tower at the northwest corner and a polygonal water tower by the river. Much stone was removed from the site in the eighteenth century, in 1705 for St. Olave's Church, between 1717–1720 for Beverley Minster, and in 1736 for the landing stage of Lendal Ferry. The abbot's house, which was constructed of brick in 1483, still survives today as the King's Manor due to the fact that it served as the seat of the Council of the North in 1539; the abbots of St Mary's and the abbey featured in the medieval and early modern ballads of Robin Hood, with the abbot usually as Robin Hood's nemesis. The Abbot supplied four chests for the use of Philip Tilney, treasurer of the English army prior to victory over the Scots at the Battle of Flodden. The Abbey seems to have become the accounting office for the army in the north, involving Thomas Magnus, Archdeacon of the East Riding, and two monks of the abbey, Richard Wode and Richard Rypon. St Mary's, the largest and richest Benedictine establishment in the north of England and one of the largest landholders in Yorkshire, was worth over £2,000 a year, (equivalent to £1,210,000 in 2015), when it was valued in 1539, during the dissolution of the monasteries under Henry VIII; it was closed and subsequently substantially destroyed. On 26 November 1539 the Abbey surrendered £2,085 and 50 monks to the crown. The Yorkshire Museum contains many finds unearthed on the Abbey site, including a series of life-sized twelfth century sculptures of saints and prophets.